Scotsman Mike Scott’s puckish comet of a persona has blazed a trail of unabashedly romantic, mystical and ambitious Celtic rock ‘n roll wit and wisdom across the musical sky for a few decades now. He reached his musical maturity in, oh, 1985, and the quality hasn’t let up since. He’s produced a wonderful discography of consistently interesting, uplifting and enlightening music (which I give good ink to here and here), and is also a dynamic live performer with a knack for putting together crack bands to bring his music to life. I’ve seen Scott play four times now, the first time in the late eighties (or early nineties?) on the Room to Roam tour, then touring his solo album Bring ‘Em All In, a few years ago when he was touring The Book of Lightning, and the concert I’m about to talk about. The wife and I trekked across town then down into the grounds of the Canadian National Exhibition, which is not something, Mr. Scott, that I would do for just any musical act. The Queen Elizabeth Theatre is a new building in a city full of downtown venues, so it seems a bit superfluous as a venue to me, seeing as it’s stuck in the CNE parking lot gulag. The place was good ‘n full though, which was nice to see. After a brief opening set by very Dylanesque Scottish folksinger Freddie Stevenson (accompanied by a pretty darn tasty banjo player), Scott and the band strolled out dressed in some natty vintage-looking suit attire. I had not read up on what the theme of this tour would be, but I should have gleaned it, considering there’s some super-deluxe version of the classic Fisherman’s Blues album (which you will see on this fine list) coming out. When they launched into “Strange Boat” right off the bat, followed by “Fisherman’s Blues”, and in short order, “We Will Not Be Lovers” and “When Ye Go Away”, it sure was a trip back to 1989 for me. I actually felt a little emotional remembering how inspired my younger self was by this music. Scott had pretty well stayed away from that material on the previous tour I saw. There were also spirited versions of songs going all the way back to the band’s first album, the chestnuts “A Girl Called Johnny” and “The Girl in the Swing”, as well as several songs from This is the Sea, “The Whole of the Moon” (naturally), a roaring rendition of “Don’t Bang the Drum” and a vitriolic encore of “Be My Enemy”. There were even two songs I’d never heard before, one a rather silly but fun glam-rock tribute to Elvis. All of this made me quite nostalgic, I must say. Though why Scott ignores his masterpiece, A Rock in the Weary Land, is beyond me. But hey, it’s his show. 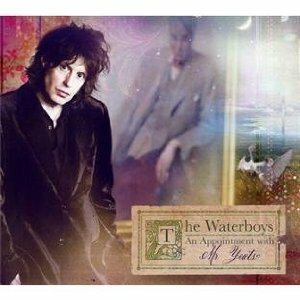 And to remind us that The Waterboys are most definitely still a vital artistic force, the band played several songs from the recent, excellent An Appointment With Mr. Yeats album. To the crowd’s credit, a good deal of attendees seemed familiar with the material and listened rapturously to beautiful renditions of “White Birds” and “Song of Wandering Aengus”. While Yeats’ verses that reference Roman orators and Greek philosophers may seem a bit incongruous in a rock context, there’s no doubt that these are some of Scott’s most inspired and well-arranged songs, ranging from aggressive Celtic rock worthy of Horslips in 1973 to delicate, airy ballads. The band itself featured a number of new faces. Longtime member Steve Wickham played his usual virtuosic, flamboyant counterpoint to Scott’s cocky strut, ever the fiddling pixie, alternating between a traditional fiddle and reeling off wild rock solos on an electric violin. Scott and Wickham make an incredibly magnetic and dynamic rock team. But guitarist Jay Barclay distinguished himself with a number of very melodic solos (including a dramatic “guitar war” with Wickham, donning masks, exchanging licks and featuring Middle Eastern scales) and also helping out on mandolin and banjo. My wife was particularly impressed with the rhythm section (god bless her! ), and it’s true that some fabulous drum fills on “We Will Not Be Lovers” stole my attention for much of the song! Unfortunately, and this is probably due to the limitations of this newer venue, the mix did not come across well, with organ solos blasting our ears while a lot of Barclay’s fine playing was lost in the murk. A couple of audience notes from a grumpy aging man and musician. I’m tired of these things and must note them. —Yelling things like “We love you” or trying to make wisecracks to bands is stupid. What are you looking for? Attention? There’s always a few bozos who feel the need to desperately try to interact with bands. Stop. They’ve heard it all before and you just sound pathetic. Go Tweet your love for them in silence. —I heard a guy behind me expressing his disappointment at the crowd’s perceived lack of engagement. I guess he wanted everyone to freak out on their feet for two hours, ’cause that’s, like, rock ‘n roll, maaaan. Don’t you want the band to feel looooved? Well, dude, don’t worry, the band has an attentive audience of people really enjoying the show. They’re happy. The applause was loud and long. And some of us like to listen to the music rather than hoot and holler for the whole set so we can go home feeling like we had an awesome time at the rock show. OK, but sour blogger’s grapes aside, I left really happy with Mike Scott’s ability to give us a different show every time, with a varied selection of songs from his discography and a fervent and infectious onstage energy. Long may he and his band roam. Great capture of the show – they had been on my wishlist for ages and I was so pleased to finally catch them. It was as much an artistic performance as it was a concert. Wishing he hadn’t skipped a couple of my fave tunes, and the whole encore situation was a bit wacky, but overall I really enjoyed the night. Thanks! I guess we all hope our faves will be played. I did wonder what was up with the encore. Hm, maybe somebody’s watch was off! But yeah, I don’t think it was quite 11. But hey, one more song wouldn’t have made too much of a difference. Unless it was that damn “Wind in the Wires”, which would have sent me home in ecstasy! From where I sat, immediately after Be My Enemy, the Roadie tried to hand Mike an acoustic guitar in exchange for the electric he was playing, and Mike waved it off; thus ending our evening. I had wondered what that was all about, but your curfew may have explained it. No doubt the venue told ’em they were through. That happened to my band during our brief (very brief) time playing theatres. how anyone can go to a Waterboys concert and hear those toons WITHOUT dancing is beyond me. I find it IMPOSSIBLE to sit still when Don’t Bang The Drum or others let rip. It’s only natural! Hey, I love it when people dance… Each person has his own response to the tunes! I just dance at home where no one can see me. Yes, brilliant summary of the gig. Been to 7 WBoys shows in my time [Tor and NYC] and thought this was one of best set-lists so far. Agree the omission of ARITWL material was disappointing; as was not hearing the perennial The Pan Within, but can’t have everything I suppose. Loved hearing A Girl Called Johnny and The Girl In The Swing. Also agree with your opinion on the wisecracks; having met both, I sense Mssrs. Scott and Wickham are not fond of it either. Thank you – I just don’t get what the deal is with people trying to interact with musicians who are trying to tune their guitars and focus on their show, by screaming lame expressions of affection or bellowing for unrehearsed songs. Grrr. I guess I should be more understanding, since the punters don’t know how a rock show is put together. Well, someday I hope to hear “The Wind in the Wires” live, that’s all I can say. There was that awkward moment when Mike sat down at the keys, about to begin a song, and asked the roadie “hey mate, how can I get my pedal to sustain ?” In the ensuing silence, some joker yelled “Viagra”. Kinda funny, but it was very annoying, and Mike seemed displeased, not reacting and then pausing for things to settle before beginning. I really loved the show, though. That’s a hardworking, focused band. Mike seems so committed to delivering a complete experience to the audience. Very admirable. See? So annoying. Fools, I tell you! And yes, the reason I keep shelling out the cash is because Scott and Wickham always give Coach 110%! I don’t really get, though, how a dude making such sensitive music could have even a single meathead fan, but then I guess any gathering of people is a microcosm of our sad society as a whole. Great review…well said…and very much my own sentiments, although I HATE theatre gigs — could barely stand (no pun intended) being confined to me seat the whole show…just don’t understand it. Thanks to Mike for putting in a full and complete effort — VERY entertaining. I have a feeling the acoustic guitar at the end was for “This is the Sea”…just a hunch. Well, the women around me were bellowing for that song, that’s for sure! I must be older than you, because I like to sit. My back hurts after an hour. By the time the Steven Wilson show was over this summer, I thought I was going to need surgery. And when I go to shows at The Phoenix, I get really irritated by all the jostling. It’s like being on the subway in rush hour. Having said that, for people who like to groove, I can imagine a seated show is pretty restrictive. And I have no objection to grooving. 47. And can’t shake the groove 🙂 Fortunately, it was standing only at The Replacements. Great review, I have had the great fortune to see them in TO many many times. With a catalog as large as their’s we are all bound to be somewhat disappointed in the set lists. They performed tighter at this show than at the Molson Ampitheater in July. Highlights, Mad as the Mist and Snow and of course Don’t Bang the Drum. Strange audience with the shout outs and such. I’ve heard in the past Mike Scott has abruptly ended shows due to “misbehaving” audiences. Thanks! I’ve never seen a disappointing Waterboys show. Thanks for your comments on the Molson Amphitheatre show. Sadly, I had to “kijiji” my great seats for that “opener” with Great Big Sea due to vacation conflicts. I too hope it won’t be another 6 years. That said, I sense there will be more frequent appearances here north of the border now that Mike Scott resides in NYC; assuming he and the band keep getting a good vibe from a well-behaved (?) fan-base.